How Much Water Should You Drink Daily To Keep Hydrated? How much water should you drink daily? How much is “a lot”? How much is “enough”? We are often told that we need to drink at least eight glasses of water a day. How do we derive at eight glasses? How much is a glass? Does this apply to everybody? Half of your body weight in pounds (lbs) convert to oz. So how much is that if you split the amount into glasses of 8 oz each, to be drunk throughout the day? This means, the heavier your body weight, the more water you will need. This is the minimum amount of water you need to drink in a day. To make it easier, here’s a simple chart that you can pin and refer. Exercise: The more you exercise, the more water you will need to drink to keep hydrated. On top of your minimum requirement, an additional one or two (8-oz) glasses for every hour of exercise would help your body to rehydrate properly. Environment: In hot and humid weather which causes you more perspiration and urination, drink additional glasses of water to replenish loss of moisture and to keep hydrated. 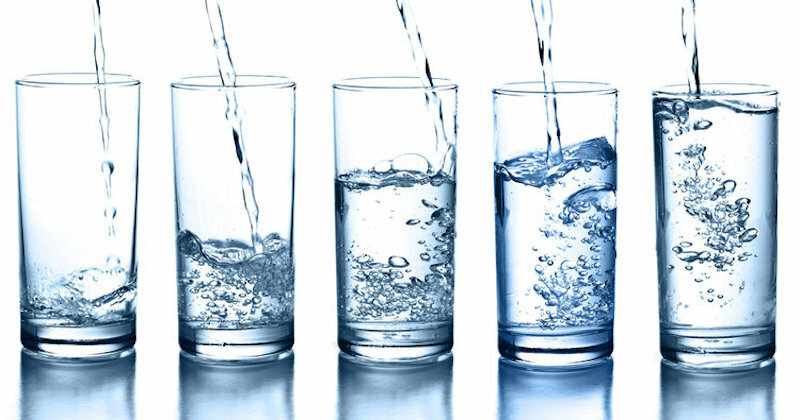 Detoxing/Cleansing: When doing any form of detox or cleansing, always add another 20-25% to your daily water requirement. When detoxifying, drink more water to help your liver and kidneys flush out the toxins, and also to prevent constipation which can cause the toxins to be reabsorbed into your kidneys. Illnesses or health conditions: When there is fever, vomiting or diarrhea, your body loses water which needs to be replenished with rehydration solutions. Other health conditions like urinary tract or bladder infections may also require you to drink more. Pregnancy or nursing mothers: For pregnant women, the above formula applies, to include the weight of her pregnancy. For nursing mothers, endeavour to drink at least two to three glasses (8-oz) more a day, on top of your minimum requirement. Related reading: What happens to your body if you replaced all beverages with just drinking water. 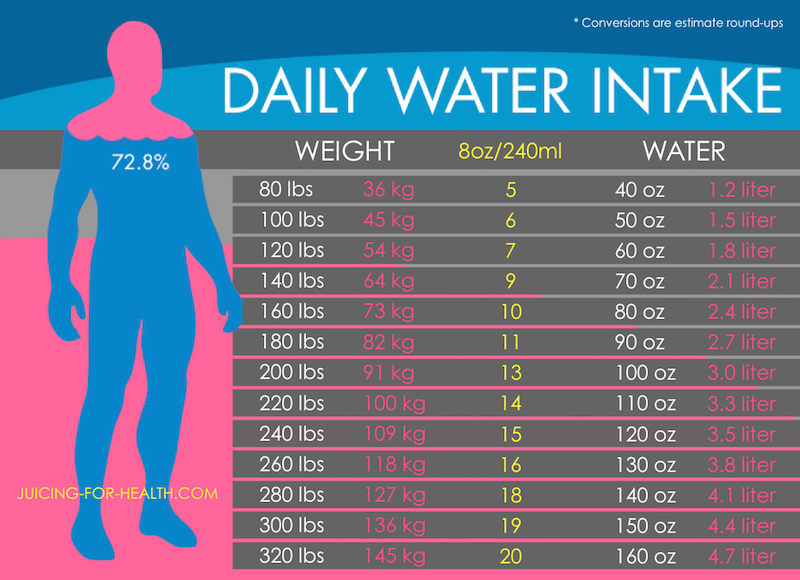 Once you worked out your daily water requirement using the chart above, the next important step is to take action! Remember to drink! Every morning I fill up my two 1-liter jars and leave them on my desk in my office to remind me that I have to drink all of that water. I pour a glass every hour and drink throughout the day. If you’re often on the go, get one of these time-marked bottles that will help to remind you to drink your daily requirement. The time-marker is great to help you spread out the water throughout the day, instead of drinking them all at one go, simply to meet your quota. Overdrinking water will just be eliminated as pee, instead of being used for hydration. A teaspoon of apple cider vinegar or a tablespoon of vinegar honey to a glass of water to break down fats. It also helps to keep your blood pressure in check. Squeeze half a lemon into a glass of water to be drunk once a day. Lemon water aids digestion and waste elimination, thus controlling constipation and diarrhea. It also helps relieve heartburn, bloating and belching. It has many other health benefits and alkalizes the body. Stir in a pinch of sea salt for every 8 oz of water you drink. Sea salt has over 80 types of natural mineral that are beneficial for our body and helps aid many health conditions, including clearing the lungs of excessive mucus and preventing muscle cramps. Unlike table salt, it actually helps reduce blood pressure. Sea salt is live salt, it doesn’t make you thirsty. How to add natural salt in your water for hydration therapy. There are several fascinating reasons why it is better drink warm water rather than cold. Read also: What type of water to drink? Drink to your health. It is an easy thing to do!